Question: It's pretty common knowledge that people can over-exercise - i.e. work out too much without getting proper rest in between workouts. Overdoing it can lead to injuries, fatigue, reduced gains, apathy, etc - exactly the opposite of what one is trying to achieve. Along those lines, is it possible to over-exercise dogs? 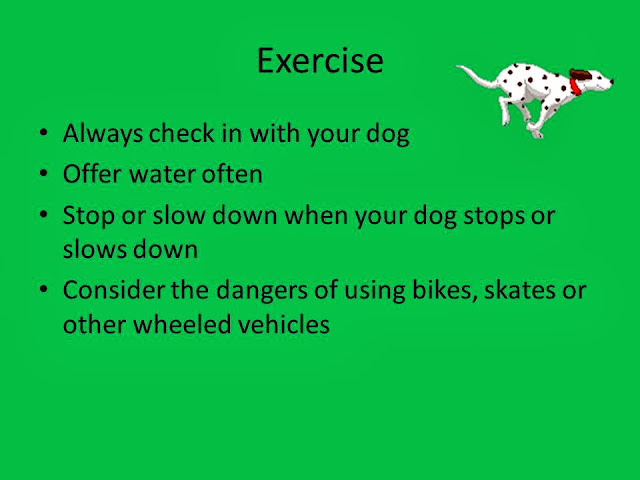 For example, by taking the dog to a dog park too often, by jogging/riding a bike with the dog every day, playing fetch every day, etc? Or is there enough time at night and during the day for a dog to get all the sleep and rest he/she needs? I have a Jack Russell, so he's always willing to go - and a lot of activity makes for a calm dog. I just want to make sure not to overdo it. He'll never say no to running around. Thank you so much for your question. This is a really good subject to talk about. One that's so important, I think it might take me several posts to cover. I'll start with what you wrote in your last sentence: "He'll never say no to running around." I'm really glad you notice this in your dog. Some people might not. One of the reasons that we humans love dogs so much is because they seem to be eager to please. While this is probably an overly anthropomorphic concept, we do know that if we keep going, a lot of dogs will keep going as well - sometimes to their detriment. 2. Dogs can easily get over heated or exhausted. They wear fur coats all of the time and they don't have sweat glands. So they can't dissipate heat like humans. On warm or hot days, a human might be able to easily jog 5 miles. But a dog attempting to do the same thing could suffer from heat stroke. 3. We know that dogs dissipate heat by panting. But did you know that dogs can't pant and gallop at the same time? See video below or click here. How do we keep our dogs safe? 4. Always check in with your dog. If the dog is panting excessively, if the tongue is hanging out, if the tongue is wide or curled, take a break. 8. If you are an avid jogger who "gets in the zone" or gets a runner's high. It might be safer to jog alone. If you are about to get into the zone but your dog wants to rest, will you stop? One of the best posts ever, thank you for the great info. Too many great points to mention. Is it more dangerous in cooler weather? I've noticed my dog can run around much longer without getting tired when the weather is cooler than when it is very hot - it's quite amazing how much energy he has when it is cool. Is this all relative or can he be hurting himself when it is cool (for example, like an athlete who takes painkillers doesn't know when to rest). I'll write more about this in a blog post.